Actually, quite a lot. There are many actions large and small that any person can do to help save species – and if we all do them, we could change the planet. Start now. Why a reusable bag bill? Plastic bags are trash. Made from nonrenewable oil and gas, they clog recycling, become litter and end up in the ocean, harming marine life. We don’t need them. We’re joining with a state-wide coalition to eliminate plastic shopping bags in Washington. Join us. Point Defiance Zoo & Aquarium is partnering with University of Washington, Tacoma and Northwest Trek on a citizen science project – reporting sightings of carnivores like coyotes and raccoons in the Tacoma area on the iNaturalist app. Join us! Palm oil is a form of vegetable oil, produced from the fruit of the oil palm tree, that you likely eat or use every day. It is a common ingredient in thousands of foods, household cleaners, cosmetics, and other personal care products, from peanut butter to lipstick. Some is produced in ways that sustain wildlife and support the local economy. But some involves cutting down swathes of rainforest. Download this sample letter and write it now. 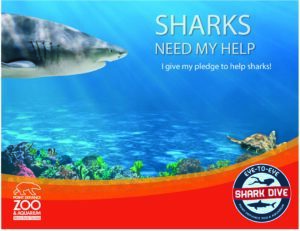 Use your Seafood Watch card, visit the website or download the phone app to choose sustainably harvested seafood – a practice that avoids the unintended capture of sharks. Turn off your engine while waiting in your car for 30 seconds or more (except in traffic). This is better for your engine and better for the planet! Park your vehicle and go inside rather than waiting in the drive-through line at restaurants and banks. Turn off your engine while waiting in loading/pick-up zones, such as when you are picking up your kids from school. Download the Idling Myths & Facts pocket card. Why should we stop idling? Carbon dioxide is emitted by vehicles and other machinery as fuel is burned. According to the Environmental Protection Agency, every gallon of gas you use produces about 19 pounds of carbon dioxide. When there is too much carbon dioxide in the atmosphere, it acts like a blanket, trapping the sun’s heat. This extra heat can change a habitat so much that some of the plants and animals that depend on that habitat can no longer survive there. It’s not just polar bears that are affected by these changes in seasonal temperature. In the Pacific Northwest, salmon, orcas, wolverines, western pond turtles, Oregon silverspot butterflies, Oregon spotted frogs and burrowing owls are also at risk. Find out about Actions with Impact from Polar Bears International. As the climate changes, people and animals depend on healthy plants for habitat, food, clean air, carbon absorption, even protection during natural disasters like earthquakes (they mitigate landslides) and tsunamis (they reduce wave force and offer shelter). Yet plants are also threatened by climate change – they can’t migrate as fast as animals when it’s too hot or dry. We’ve filled our Zoo with a myriad of plants and ecosystems that benefit animals and humans alike. Explore ours – and plant your own to help slow the effects of climate change. Humans generate about 300 million tons of plastic each year – and 8 million tons end up in the ocean. These plastics, like bags, straws, and bottles, flow into the ocean from storm drains, litter, landfills and recycling stations. 80% of ocean trash starts on land.